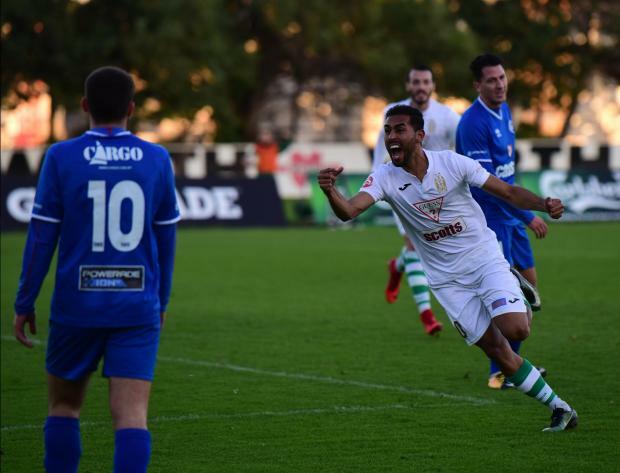 Tiago Galvao wheels away after scoring Floriana's opener. Photo: Mark Zammit Cordina. Floriana returned to winning ways after defeating Tarxien Rainbows 4-0 in a below-par contest at the Hibs Stadium, on Sunday. For newly-appointed coach Guido Ugolotti this was his first win at the helm of the Greens on his fourth game after two defeats and a draw. Floriana could not have wished for a better start to this game as after Maurizio Vella saw his long-range effort go inches wide, they managed to find the net twice in a span of two minutes. On minute 14, Tiago Galvao darted in between Tarxien’s backline to meet Vella’s cross and send the ball behind Andrea Cassar. A couple of minutes later, Ignacio Varela let fly a thumping volley that gave the Tarxien’s custodian no chance to parry - definitely a goal of the season contender. After the change of ends, the Rainbows were a better team than in the first half as they started to push forward in order to pull themselves back into the tie. Nonetheless, it was the Greens who found the net in the closing stages of the tie with Arthur Oyama grabbing a brace. First, he profited from a Cassar’s mistake to slot the ball into empty net. Moments later, he darted into the box and lobbed the ball over Tarxien’s custodian to secure the three points for his side.